This two bedroom house was designed to be as sustainable as possible on a small suburban block. It was built in 2001. I moved in at the time of my retirement. Entry is via a curved slate path, along a wooden walkway representing a bridge over a dry water course, continuing on slate pavers surrounded by low ground cover of varieties of the herb Thyme. The garden has no lawn, uses Australian natives or plants with low water requirements mulched with coconut fibre. The large wooden front door is protected by a curved roof, where chains are used instead of downpipes. An open plan living area and study/bedroom are located on one side, and 2 bedrooms, laundry and garage on the other. To the rear is a small Japanese courtyard. 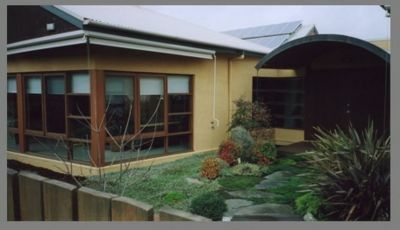 It is passive solar in design, completely self sufficient in water, has a solar hot water service in series with a gas instantaneous boost for the winter months, a grey water recycling system for toilet flushing and garden use, and now produces over 100% of its electricity from a 4.5kW photovoltaic array on the roof. The long axis of the house runs east - west enabling good solar access through the north facing windows in winter. External blinds made from Soltis fabric supplied by Ace of Shades protect the windows from the summer sun. A concrete slab covered with tiles, give good thermal mass which retains the warmth of the winter sun during the day , and re radiates the heat at night thus reducing heating and energy use. There is less diurnal variation of temperature in an energy efficient house. During hot periods in summer, the casement windows act like sails allowing the southern breezes to produce good cross ventilation and cooling. Condor vents have no moving parts, and work on the venturi principle.Hot air rises and can escape through these vents if required. The roof space is also vented. Tvek reflective wrap for external stud walls in upstairs bedroom. E-therm ( double sided reflective foil enclosing Low Density Polyethylene Foam) under upstairs bedroom floor and garage door. Residents of Australia, are eligible to take advantage of the current Australian Government Insulation Grant program to help offset the cost of finding using approved insulation installers to perform such work. All windows are double glazed except the corner ones near the front door where comfort glass is used. The cedar frames do not conduct heat . Most of the windows are located on the north, north-east side with minimal ones facing west and south. Recycled components included reinforcing steel and slag ash ( a blast furnace byproduct) in the slab, posts in the living area and at the front door, merbu for front decking, jarrah for rear courtyard and bridge, victorian ash for stairs. Radial timber was used for the decking floor and fence, and salvaged timber for the decking posts.In the kitchen reconstituted granite for bench tops and New Age Veneers for cabinets was selected. The cement bricks for garage construction were seconds. Rain water is collected via Smart Flow gutters and a first flush water diverter (Team Poly from Pakenham Tanks) in a 6000gallon ( 27,240L )tank. This supplies all the household’s needs - the house is not connected to the mains water supply. Water efficient appliances such as Asko front load washing machine and dishwasher , 3/6 L flushing toilets, AAA shower heads all minimise water use. Grey water (i.e. bathroom water and washing machine water) is passed through an Aquablock Biofilter (2 cubic meters of biologically active peat, which destroys bacteria to Class A water standard). The treatment system is EPA approved. This water is stored in an underground tank, aerated, then used for toilet flushing and the garden. Kitchen and laundry trough water is not reused. Toilets are connected to the sewer. Detergents. Only low sodium liquid detergents are used e.g. Trinature and Melrose products. Bar soaps and washing powders are avoided. Statistics. Water use has been monitored with 2 Kent meters. The water used in 3 years is equivalent to the annual amount used by the average Melbourne household. In 2005 the house was self sufficient in water and saved 75% of the average householder’s discharge to the sewer. AAE evacuated solar hot water system in series with a Rinnai Solar 20 continuous flow gas boost during the winter months, provides free hot water for about 7 months of the year. Energy efficient appliances like the Bowin Lo Nox Gas space heater and general use of compact fluorescent light bulbs reduces gas and electricity use. Current batteries are a small 48 volt bank of sealed LA recombination batteries. The batteries are just sitting on the SGB PSA inverter at 55.6 volts which keeps them fully charged (A big 5kW UPS)with a small battery bank. 32 X BP275 75W modules ( 2.4kW) plus a solar upgrade of 12 Conergy C175M Sharp modules ( 2.1kW ) are installed at latitude angle i.e. 38 degrees. Electricity is exported to the grid during the day, and is imported from the grid at night. The house has normal 240V wiring. In 2008 the 4.5 kW PV System became a net exporter of electricity i.e. production covered any electricity imported to the house as well as the distribution ( poles and wires) costs, and the account was still in credit at the end of the year. Motivation for the solar upgrade was to take responsibility for the greenhouse gases produced during my life of 73 years. The modules will still be producing 'green' electricity for at least the next 20 - 25 years. Solar Venti : SV14 for upstairs bedroom and SV30 for living area, produces passive solar heating during the day when the sun shines. A small PV panel in the unit powers the fan, so once installed there are no further running costs. Insulating paint: Thermilate added to Bio Paint was used for the interior of the upstairs bedroom. ' the Paint ' from Ability Building Chemicals containing E-spheres was used externally. My house is modern, comfortable to live in, being warmer in winter and cooler in summer, collects the water that falls freely from the sky, and uses the sun’s power to produce in excess of my electricity requirements thus reducing my ecological footprint and greenhouse gas (carbondioxide) emissions. Global warming is a serious threat to the future of mankind. We can all change our behaviour to minimise the problems. Every little bit can help make a difference. Let’s do it. Why allow rain that falls freely from the sky and is becoming a scarce resource, to run off our roof into the storm water system and out to sea? City dwellers expect to turn on a tap and get an immediate and sustained flow of water, without thinking about, or needing to take responsibility for, the collection, storage, and quality of their water.To collect my drinking water, the rain flows through Smartflo gutters which keeps out any leaves, and then through a mesh screen above the Team Poly Water Diverter Mk 2 which is a first flush device system i.e. the first run off from the roof which may contain dust and contaminants does not flow directly into the 6,000 gallon/ 27, 240 L polyethylene tank. A 5 micron filter is situated under the kitchen sink for drinking water. An SMHP90 Onga pump with 2 X Davey Supercell HP105C pressure tanks allow 100L of water to be drawn off before the pump turns on, thus saving electricity. A Rain Harvesting tank vacuum system will syphon anaerobic water and sediment from the bottom of the tank into the overflow pipe when the tank becomes full. Marble chips ( ~ 1 bucketful ) enclosed in a polyester wash bag hangs in the water to reduce acidity - in a city environment the ph of rainwater is ~ 6. Aquagauge from Electrosense Technologies measures the water level in the tank which is mostly set into the ground. A single pressure tank allows 50L to be drawn off before the pump needs to be activated. This is an energy saving measure so that the pump does not need to pump for every 3 or 6L flush. In the bathrooms Flexispray AAA shower heads limit the flow of water to a maximum of 9L per minute, and Fowler Florida Toilet suites have a 3/6 L flush. The Asko Frontload washer W6221 rated AAA uses 61L of water for a normal load, whilst the Asko D1976 Dishwasher also AAA rated uses 17.5L of water. I have recently done an energy audit on all my electrical appliances in the house and realised that using the dishwasher saves water , and hand washing up saves energy - so there is a trade off between the two. Trinature products are used for cleaning throughout the house because they contain no harmful chemicals to damage the environment. This is particularly important if recycling the water. Trinature washing liquid contains minimal sodium compared to usual washing powders( high salt content) and performs well. Melrose liquid detergent is used in the showers - it is based on virgin olive oil, coconut oil and glycerine and the sodium or salt molecule is replaced by potassium, which is deficient in most australian soils. Bar soaps are avoided as the residue that is left can block filters and pumps. There is no lawn. Coconut fibre is used for mulching the australian natives and other drought tolerant plants.An Aerobin is a recent addition to my compost bins. It is insulated , thus increasing the temperature of the compost and said to be more effective in killing weed seeds. Air enters from below and is deflected back into the compost , which requires no turning, and can be removed when ready at ground level. It took me 3 and a half years to use 240 kL of water. This was the equivalent of the average Melbournian ‘s annual household use at the time. In 1995 this household used a total of 54.5 kL i.e. an average use of 149L /day and of this amount 17.5kL was recycled for toilet flushing. Australia is the driest inhabited continent on earth. Global warming is a serious threat and changes in weather patterns and reduced rainfall will affect us all. We need to value water as a precious resource, because we can’t live without it and shouldn’t waste it. We can influence what happens in the future by modifying our behaviour - reducing our energy use, particularly electricity because it is produced from brown coal and produces much of our greenhouse gas emmissions. Consider buying a solar hot water service, installing insulation, converting light fixtures to energy saving compact fluorescents, and installing a rainwater tank. We can all make a difference. Let’s start now.